Golf is the golf of all games; the best recreation, distraction, and sport. If you haven’t played it, trust us you are missing out on a lot and the sad part is that you aren’t even aware of it. Just get hold of a golf club and try to get its feel. We assure you the feeling is going to be heavenly. To be on your own with your golf clubs and balls, expertise tingling on your fingertips, and adventure raging in your blood vessels is a feeling that cannot be articulated. You just have to experience it yourself. A lot of it has to do with clubs, but in this article we’ll be focusing on the best practice golf balls to use and why. Let’s get started! Once you get in the game, there is no getting out. So, if you are looking for something to channel your feelings and energy while at the same time honing your analytical skills and building your mind to hand coordination, it is golf that you need. If you need something to enhance your creative ability conjugated with professional finesse, then it is golf that you are looking for. And most importantly, if you are seeking to polish your reflexes, then golf is the perfect remedy for it. If you’d like, we could go on and on and on describing what a heavenly game golf is and all the benefits that it is capable of bestowing upon you. However, at the same time we are well-aware of the dilemma of a golf newbie. You may be wondering how I am supposed to experience this expertise tingling at my fingertips when I lack it in the place. How am I expected to experience the adrenaline rush which follows a perfect swing when I lack the ability to make that perfect swing? Even if you do manage to gather your guts and step into the golf field with no prior practice and experience, it is very probable that repeated failed attempts may discourage and dissuade you from pursuing golf and ultimately experiencing all those divine feelings associated with golf which we elaborated above. Fortunately, we have just the answers you need. With the aid of practice golf balls, you can perfect your swing and become a professional at the game. The important question that may sprout its head at this juncture and may nag all the newbies is that what are practice golf balls and how do they differ from golf balls? This article aims to address these very questions. Furthermore, we would also be elaborating the various types of practice golf balls out there, the best ones out of these and the sources from where you can get hold of them. Let us begin with what are practice golf balls. What Are Practice Golf Balls? You can only perfect your golf swing if you embark upon regular practice. This regular repetition is crucial for obtaining professional finesse. You can use regular golf balls for the purpose of this practice, but their driving range is much more expansive, which suggests that you will have to put in more effort and more time to attain that accomplishment level you desire. Practice golf balls on the other hand have a more limited driving range. You can practice using them within the comfort of your own backyard. In fact, you can also practice with them indoors. There are different types of practice golf balls out there and most of them are manufactured using foam or plastic. However, at times, both these manufacturing materials can also be deployed. The main difference between these types and kinds of practice golf balls is the difference in their costs as well as their feel. Let us now see how these balls function. How Will Your Practice Golf Ball Work? It has been formerly mentioned that to hit a perfect swing with your regular golf ball, you would need a vast space that is obstacle free and hindrance free. Getting hold of such a space can pose a problem for you. Practice golf balls efficiently address this issue of space, since their design makes them perfect to be used in a limited range and a smaller space. Owing to their light weight, their travelling range would also be smaller and as a consequence recovering them is easier. Also, their light weight ensures that even if they happen to collide with other objects, they would cause minimal or no damage at all. It has been mentioned formerly that there are different types of practice golf balls out there, manufactured from either plastic or foam or even a combination of both. Although you can practice your swing with any of these balls, yet they differ from each other owing to different factors. These varying factors primarily include the ball’s durability, its price, and how well it imitates the flight and swing of a regular golf ball. Each of these varying factors have further been elaborated below. Just as there are different types of regular golf balls that differ in their prices, similarly practice golf balls also differ from one another in the context of their costs. For instance, you may get hold of a pack of 18 practice balls at $6.99 which in other words means that each ball would cost almost 39 cents. At the same time, more advanced brands of practice golf balls may be selling each ball at $1 or even more. Both the type and number of balls that you buy influence its respective cost. Durability is another main factor which distinguishes between different kinds of balls. There are some varieties that may get totally deformed or crushed after some hits. Other, usually more expensive practice balls, have a better quality, thus making your investment worth it. The crucial factor that distinguishes between different practice golf balls is the extent of mimicry of a regular golf ball. Generally, it is observed that high end balls which may be a little more costly successfully manage to imitate the flight of a regular ball. Their compressed core is partially responsible for this successful imitation. When the club head and ball collide with each other, the generated feeling resembles, to a great extent, what is produced by a regular ball. In contrast, low-end balls or plastic balls may roughly imitate the flight. However, upon impact, they fail to produce the same feeling. Now that you have understood what practice golf balls are and what they do, let us consider the best ones available in the market and the reasons which classify them as the best options. Bluntly put, there is a myriad of practice golf balls out there. However, some of them are of pathetic quality and are practically useless. The rigid plastic ones having no holes in them are an example of such balls. Hereby, we have listed down some of the better options which may be a little costly in comparison, but are better imitators of regular golf balls and are more durable as well. This ball has a compressed core with a neither too hard not too soft covering. It greatly resembles a golf ball, but at the same time its driving range is limited and it wouldn’t travel too far. 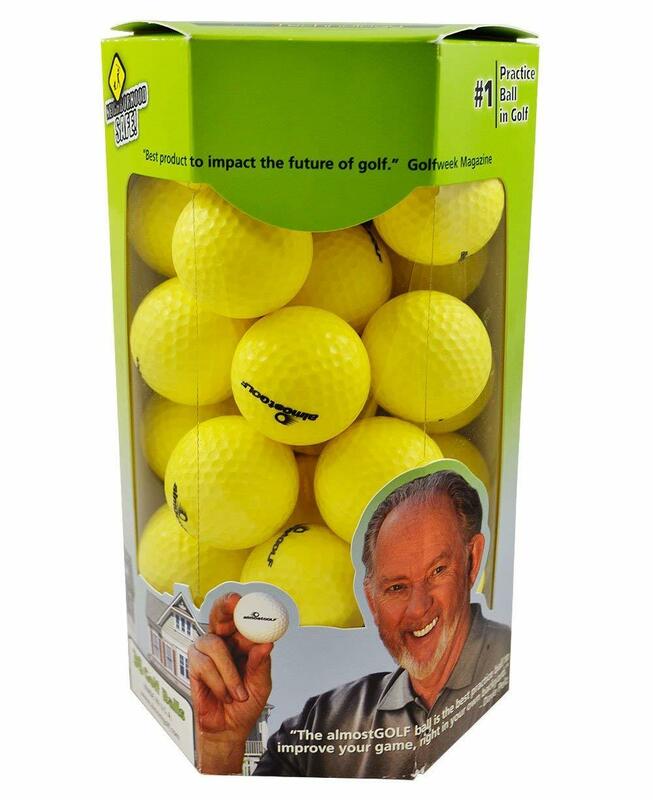 These balls are perfect for beginning players and are a wonderful training aid. This ball is manufactured from cross-linked foam. It is light-weight and weighs almost 14.5 grams. These traits make it a perfect must-have for golf training since it promises a limited driving range conjugated with real feel. It is important to note that its COR rating is close to that of a regular golf ball, almost its one-third. Moreover, its soft but not excessively soft. Its construction makes it undergo a slight compression which greatly resembles that undergone by a real ball on impact. Its durability is long-lasting but its compressed core also makes it incredibly soft, thus making it perfectly safe to play with in your backyard. The distance this ball travels is also one third of that covered by a real ball. This Almost Golf Ball is so durable, you no longer have to hesitate before hitting it to try to make your swing soft, because this practice golf ball has the potential to endure all sorts of force, resistance, and velocity. Almost Golf Ball is the number 1 practice ball to seek improvement in your game. Also, you don’t have to go to any lengths to practice. This ball makes it possible for you to easily practice within the comfort of your own backyard. Not only will this practice be easy for you, but it will also be equally rewarding. AlmostGolf ball is also the perfect ball for beginners to get introduced to the game. All the fundamentals and basics of the game can be learnt easily and comfortably while at your own home. You may have always wanted to play golf, but may have been hindered by the obstacles of time or money. AlmostGolf balls take care of all such obstacles. You just have to get hold of club heads and your pack of Almost Golf balls and you will be all set to play the game. There would be no getting out of your house, travelling to a facility and then playing. This practice ball makes it all easy and convenient for you. Fun is a very important aspect of the learning process. Learning can be difficult and tiresome if you do not enjoy the process. With Almost Golf balls, you can practice within your own backyard, create your own practice routines, and thus learn with ease and fun. You can benefit from these balls if you do not intend on entering into professional golf, since you can use this ‘home-golf’ as a fun, family activity. Beginning learners may get intimidated by the prospect of playing on a professional golf course with a full-fledge driving range and with peers around them. With the help of AlmostGolf balls, you can practice at home until you gain some confidence in the way you play. The best thing about these balls is that they not only make your game less intimidating for you, but they also give you an adequate feedback and a response which greatly resembles that of a regular golf ball. Thus, improving your swing and flight. You do not have to fear any broken objects or any consequential damage of the game. You no longer require nets or proper facilities to play. All you need is your own backyard, 40 yards of land and your golf equipment. Your AlmostGolf balls with their soft structure and compressed core will make it possible for you to play safely without having the fear of breaking anything. 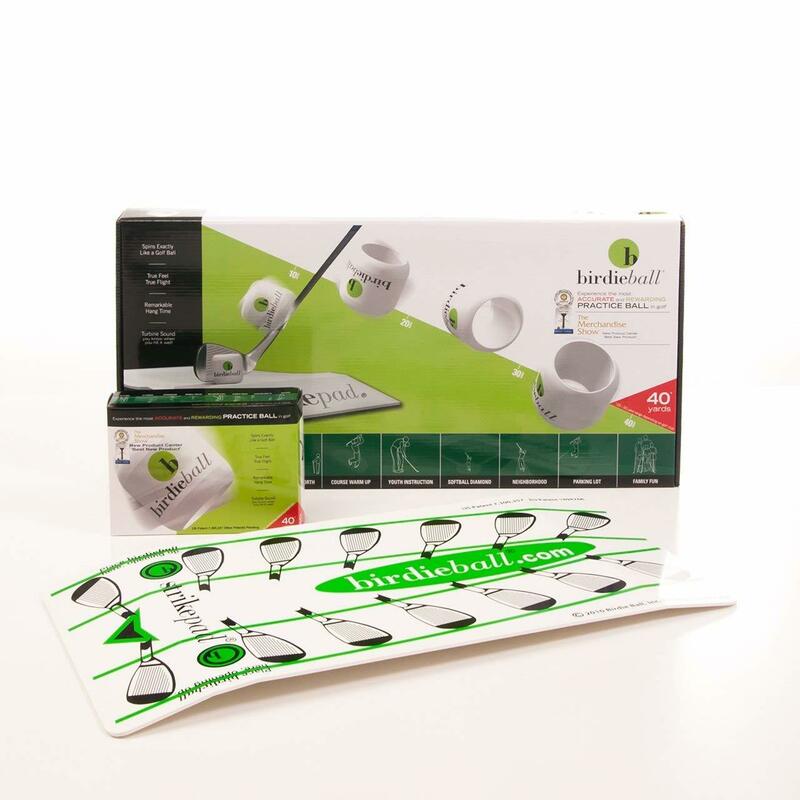 Birdie Ball is another good option when it comes to practice golf balls and is our and the golfing world’s favorite. It has won numerous awards overtime and has managed to gain a lot of attention. It doesn’t have a conventional shape and looks like a napkin ring. Its impact resembles a real golf ball, however, it also doesn’t fly to a great distance due to which it is easy to recover and make a hit again. The maximum distance it covers is approximately forty yards. The intriguing bit about this Birdie Ball is that it doesn’t look like a ball. Rather, it is shaped like a hair curler or a little tube. Although, it doesn’t look like a ball, when it collides with the club head, the feeling is just like that with a regular golf ball. The Birdie Ball also offers another training equipment that can come in really handy called the Strike Pad. This hitting pad also paves the way for you to make a perfect swing, however, it does differ from your conventional hitting matt in several ways. Its cambered structure makes it feasible to absorb shocks made by downward swings efficiently. Moreover, its light weight is another appealing factor since it can be easily carried around. On a full swing, this ball would cover a distance of merely 40 yards which is similar to that covered by an AlmostGolf ball. Despite its unusual shape, it does seem and feel like a real regular golf ball on impact and when it makes its flight. It also gives you reliable and quality feedback about your performance. You can perform various functions with the Birdie Ball, such as fading, drawing, slicing, and hooking. All of these are followed by instant feedback. Both the shape and performance of the Birdie Ball is revolutionary and thus won the ‘Best New Product’ award in 2005 at the PGA Merchandise Show. When you make a good hit, the Birdie Ball will produce its conventional ‘whack sound’ which will let you know whether your hit was on target or not. This whack sound is intensely gratifying. It is like a pat on your back, praising you for what you have done and encouraging you to go on. Golf professionals have given the birdie ball their recommendation and have asserted that this ball works best for both beginners and professionals. A lot of popular and high-repute periodicals have featured the Birdie Ball. All major networks including ESPN, Fox Sports, and The Golf Channel etc. have published this ball’s reviews. It has been given an approval rating of 92% by PGA and is endorsed and deployed by hundreds of golf instructors across the globe. Why is Birdie Ball shaped like a napkin ring? The answer is purely scientific. (Although, if your aesthetic sense prefers this shape then it is an additional benefit). The Birdie ball has a non-aerodynamic shape. When you hit it, as soon as it leaves your club, its shape starts to resist its flight and it begins to stop. Both its surface, which is non-dimpled, as well as its sides, which are straight, serve to resist this flight. As a consequence, when your club-head collides with the ball, the impact produced feels very real. It also hangs in the air just as a regular golf ball does which covers a comparatively much larger distance. Floppy is so far the best practice golf ball if you prefer to play indoors. It is very soft and thus doesn’t do any harm on collisions or impact. So in other words, you get to have the real feel of a real golf ball minus any broken glass. It is also perfect for you if you prefer to play pitch or chip shots. Floppy is an excellent addition to the market of golf training aids because its spins like a real ball, reacts like a real ball, and also rolls like a real golf ball. It is different from the formerly elaborated balls because of its extremely soft structure. Although, both its flight and impact greatly imitates a regular golf ball, however, it is extremely soft. So soft that you can easily press it. This softness and flexibility make the Floppy Ball very special. Even if it hits a window it wouldn’t cause any damage. All it will do is just bounce back. Short game in an extremely significant aspect of your golf game and the floppy ball provides you the platform to practice and perfect this very game by pitch and chip shots. Undeniably, the floppy ball is perfect to be played indoors, however, this doesn’t indicate that you cannot play with it outdoors as well. However, be careful not to hit at it with bigger clubs, since the floppy ball was especially created having a pitching wedge in the forefront. You may also find other foam practice balls which may just work equally well. The old versions of wiffle balls are also workable. They come cheap and can be found at any sporting retailer. However, they do not give the feeling of a real impact. Whatever way you like to practice, any of these practice golf balls will help with your improvement and we strongly recommend that you incorporate them in your daily/weekly training routine. Because don’t forget, it’s the little details that can make the huge difference! Good luck with your practice and may the fore be with you!